Worried shaving with a safety razor is going to be a blood bath? 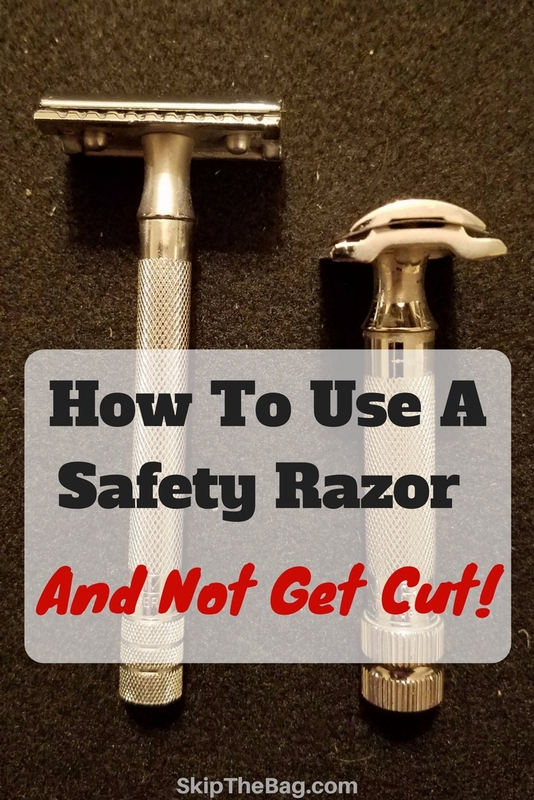 I'm here to tell you not to worry; it won't be like a scene out of a horror film once you read these tips for how to use a safety razor. Safety razors are a great way to minimize plastic waste in the bathroom. Most disposable razors have some sort of plastic that you throw away: either the entire razor or the razor cartridge. Safety razors, however are plastic free! You just replace the blade which may be able to be recycled. For some reason safety razors have received a bad rap that you are more likely to cut yourself. Well they don't call them safety razor for no reason. 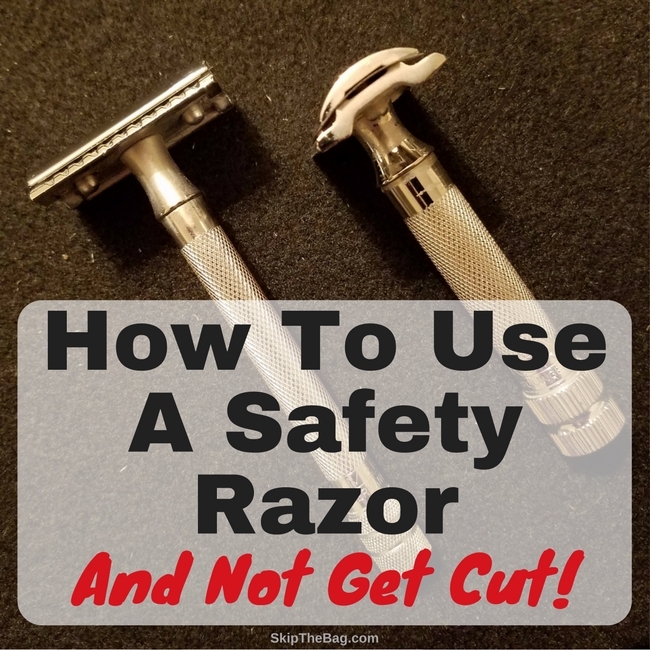 I was nervous too when I first started, but once I actually did it, I realized that it wasn't a whole lot different than using a regular razor. However there are some tips which will help you get a close shave and minimize the likelihood of getting cut. The general goal of using a safety razor is to have the blade run along a smooth shaving surface with the blade in the optimal position to cut the hair without cutting the skin. A way for the site to earn advertising fees by advertising or linking to certain products and/or services. This post contains affiliate or referral links. Hubby uses a short handled razor and I use a long handled one (read a review of my favorite zero waste safety razor here). And we both prefer the ones we have over the other. I think his short handled razor is better for the large number of angles he has to deal with. I guess you could say the short handled razor is more maneuverable. 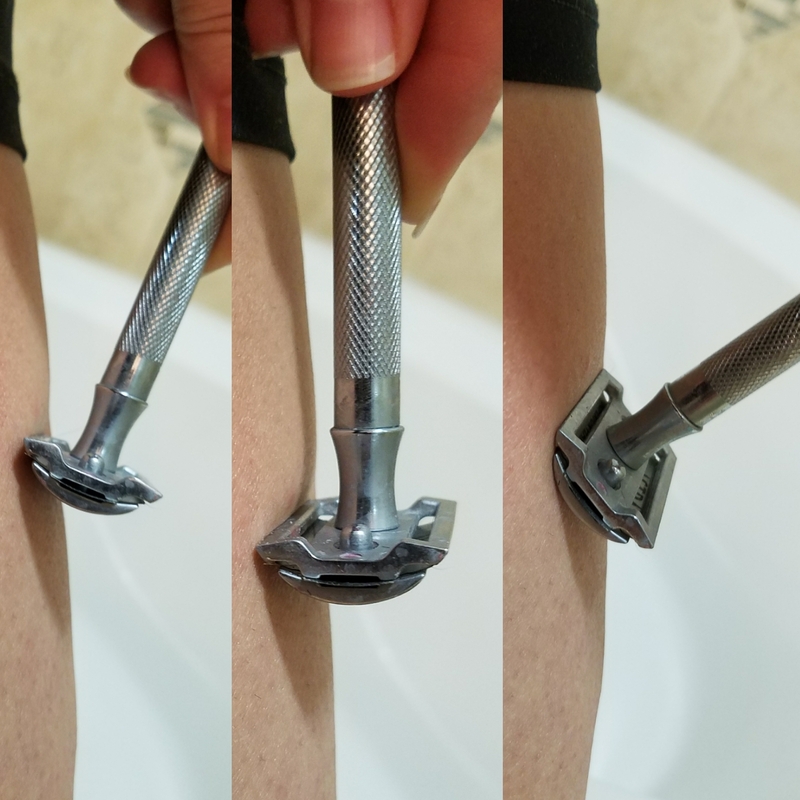 I prefer the long handled razor for shaving legs. It helps extend your reach, plus it's more similar to other razors you are used to. 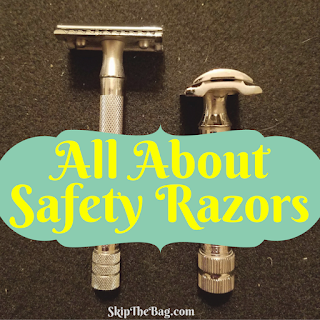 For more on kinds of safer razors read All About Safety Razors. Obviously the first time you use the razor the blade should be new. Don't share blades: that's just asking for trouble! However you should change blades (or sharpen them) if you notice it is getting a bit dull. Getting cut with a newer or sharper blade will make a smaller cut and it will heal more nicely. Try these blades. two don't get the blade in proper cutting position. The angle is important for the razor to work and provide a close shave. If you make the angle of the safety razor too shallow you'll just be moving the glide along and if the angle is too high it's just the top. Either angle will not cut the hair well and you are liable to get cut. Fortunately most razors are shaped in a manner that tries to encourage the correct blade angle. In the photo you see the first two put the blade at a bad angle, but the third has the razor run right along the leg. You will find this advice everywhere, but honestly I generally run my blade the length of my shin, calf and thigh. So why am I advocating it here for you? It's easier to keep the 30 degree angle with shorter strokes. Legs and faces are curvy places, each curve means you have to continually change the angle. So using shorter strokes will likely help you keep the angle, but it's the angle that's magic, not the stroke length. Doing this will help extend the life of each blade and prevent rusting of the razor itself. I'll admit I'm not great about this. Just this morning I realized my blade had soap scum in the blade guard. Whoops! Well I cleaned it out and changed the blade and I noticed it shaved so much better! A safety razor head has a little heft to it and it's designed that way for a reason: to keep it close to the skin. You don't need to push down on it. In fact, if you push you mess up the angle and prevent a flat shaving surface and can cause cuts. Believe me, you don't need much pressure. The blade wants to cut the hair, just put it in the right spot. I don't have issues with this on my calf and shin, but up around my knee I've found I provide a flatter shaving surface if I pull the skin taut. This is something to help the razor run more smoothly along the shaving surface. I'll admit I don't have to use a lubricant, but I notice it slides easier and jumps less (so less potential for knicks!). I have dry shaved on the side of a bathtub, but I know not everyone can do this. So for lubricants there are a number of options. I generally either just use water while in the shower, but find I like using soap better. The lather of regular soap doesn't stick around long, so getting shave soap may be better. I've heard others use conditioner or olive oil. Whatever you choose to use the goal is to help the blade slide along your leg. Be sure to rinse the lubricant off the blade though or it will get dull. Finally, I have cut myself exactly once using a safety razor. It was on my shin, not a "high risk" area like ankle or knee. I had been using the razor for about a month and I have no clue how it happened. I didn't notice it until after I was out of the shower. That one cut is probably more than I received in the last 5 years of using disposable razors, however it is nowhere near the number of cuts I received while first learning to shave. So if you do cut yourself I recommend being patient while you are learning. In general, using a safety razor has been no different than using disposable...except from an environmental and cost perspective. Looking to buy one? Check out this one!! Don't forget to click over to to learn all about safety razors or join the weekly newsletter to keep up on all the happenings. Find this interesting? Pin it for later! I can't wait to hear how you like it! I've just bought my safety razor (the one you recommended). It arrived yesterday but now I have to find some blades for it. Our local supermarket didn't have them! Hubby bought a huge pack a while ago so I haven't looked for razors for a while, but I've had the best luck finding shave soap and stuff like that at pharmacies (CVS, Walgreens, etc). Although they only have ONE type for safety razors and rows and rows of disposables. Just goes to show you where the money is! I got to admit I don't use razors. I have a battery operated shaver that I don't even have to wet my legs and it never cuts me. The battery lasts a long time so I just don't bother trying to use anything else. I do like your article though and very good directions. Congratulations on being featured on #GoingGreen Linky. Have a healthy, happy & blessed day. I normally use shaving gel before shaving. Thus, it lubircate my skin and prevents nicks and cuts.